Book with us and pay no cleaning fees! Chincoteague Island is a perfect vacation destination. 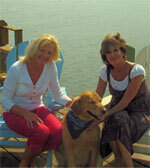 We are known for Misty of Chincoteague, Pony Penning, and delicious seafood. Our beach is one of the few spots on the Atlantic Coast which has been preserved in its natural undeveloped state. Gladys Baczek (pictured left) is an original Chincoteaguer and Anita Merritt (pictured right) came to Chincoteague in 1975 and is married to a Chincoteaguer. We know and love the island. Learn more about us. The historic downtown offers a verity of specialty shops, galleries, restaurants and Robert Reed water Front Park is a popular spot for weddings and special events. Come experience Chincoteague and Assateague Islands and see for yourself what a unique and special place that it is. Learn more about Chincoteague Island.